I don’t know about you, but when I hear the phrase ‘spring cleaning’, it tends to stress me out a bit. I automatically picture this overwhelming scenario of myself (and only myself) neck deep in cobwebs, dust and clutter, quickly realizing that I’m in over my head. I remember one year deciding I was going to deep clean the entire house in a weekend. No problem, right? Wrong. When Sunday night rolled around, I found myself in tears because I had created this impossible task and it wasn’t going to get done. In fact, I was going to wake up Monday morning with a house that was messier than when I started because I had the bright idea to empty all the cabinets and dresser drawers. Oh boy. But you know what? This spring cleaning thing does not have to be some impossible, overwhelming task. What if you could take care of the necessities in only 10 days? I’m here to tell you, it can be done. Here’s how. When I lived in Europe, Slovakia to be exact, I was amazed at how well kept everyone’s homes were. They didn’t spend hours, or have to set aside an entire week, to get the cleaning done. They knew what they needed to clean, when they needed to clean it and how long it was going to take. How you ask? It’s because keeping their homes in tip top shape was a habit for them. It’s just what they did without even thinking about it. 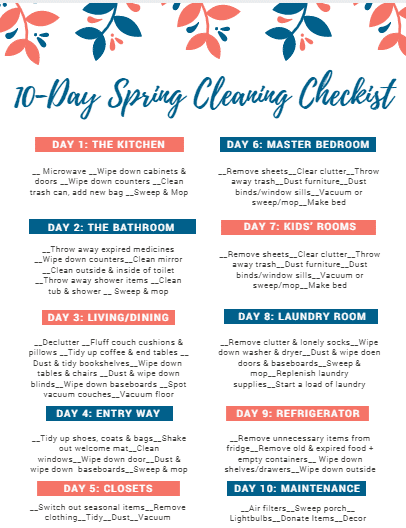 My challenge to you is to look over this 10-day spring cleaning checklist, print it out and just start. Before you know it, these steps will become habit and you won’t even need a checklist. You’ll just know what to do. Spring is the perfect time to get started and take the challenge. Let’s do this. Several of these products help me keep my home in tip-top shape year round. 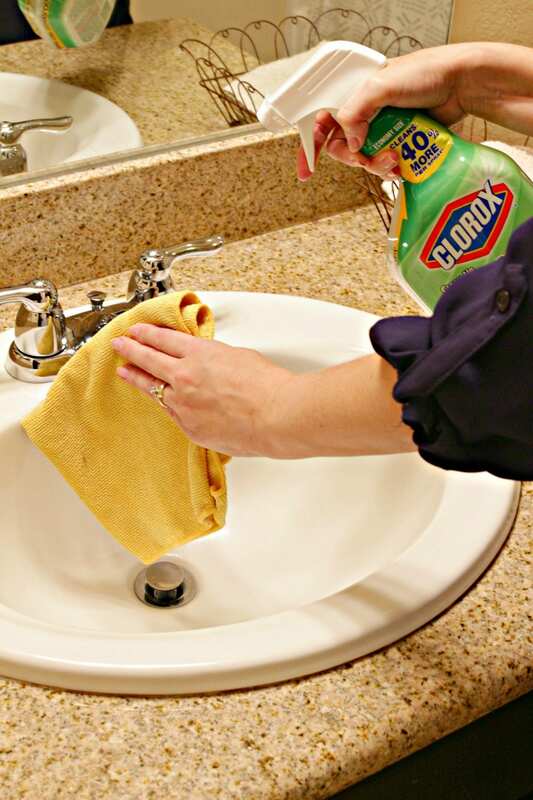 I keep Clorox wipes on hand and I am constantly wiping down surfaces, especially in the kitchen. I’m a ‘clean as I go’ cook, which helps tremendously in keeping the kitchen clean. 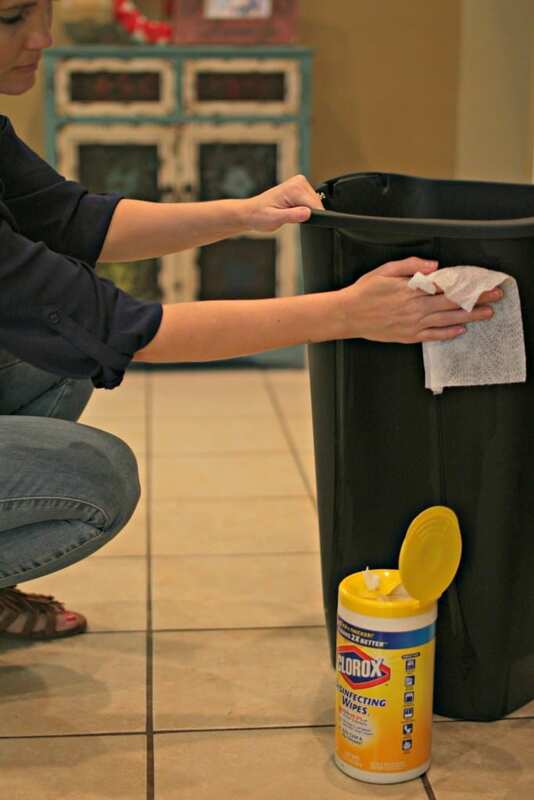 I’ve also become quite attached to the Glad trash bags that have antimicrobial odor protection, thanks to Clorox. The bags have a clean citrus scent and it makes my kitchen smell so good when I put a new one in and long after. I purchased all of my cleaning supplies at our local Walmart. You can find them in the cleaning supply aisle. 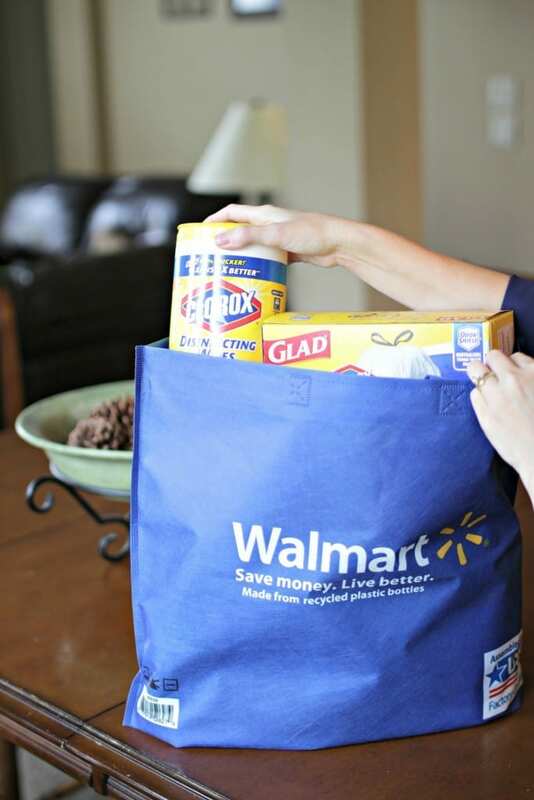 For more spring cleaning tips and info, be sure to check out this page on Walmart.com. Put on some music or your favorite podcast because cleaning is more fun with music or your favorite podcaster. Set a timer! Decide up front how long you’re going to spend in each room. When the timer goes off, move to the next room. If you don’t do this, overwhelm will set in and you’ll never feel like you accomplished something. Get yourself in a positive mindset. This may sound corny, but as I’m cleaning I like to express thanks (in my head, but you can do it out loud too 😉 ) for the fact that I have a home to clean. I used to spend quite a bit of time thinking about my dream house and then when we moved in said dream house, I caught myself complaining about having to clean it. What?! Think positive. Be thankful. Make sure you have all of the supplies you need up front. It’s very frustrating to get yourself involved in a project, only to find out you don’t have something! You can pick up all of the cleaning supplies mentioned at your local Walmart. In a microwave safe bowl, place 1 cup of water and several tablespoons of vinegar in your appliance. Turn on high for several minutes. Let it sit. Wipe down cabinets and door handles. 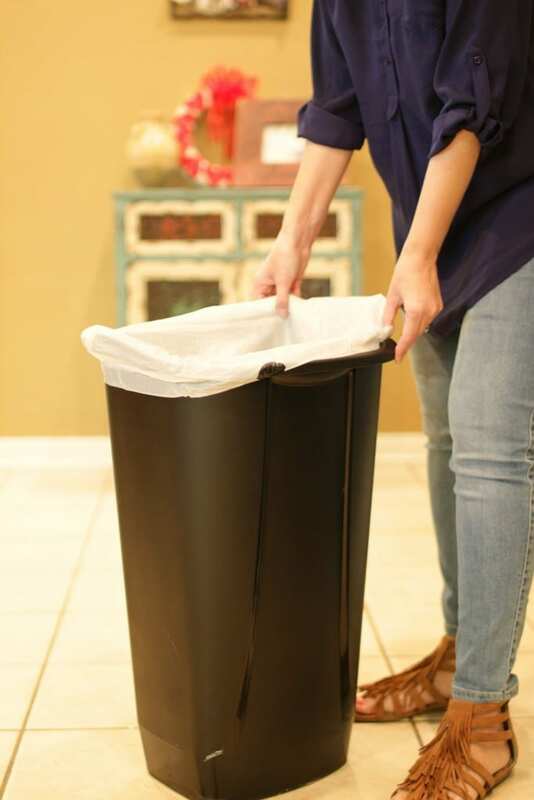 Clean trash can, wiping it down inside and out, then put in a fresh trash bag. Wipe down inside of microwave with paper towels. Sweep and mop floor with Pine-Sol. Throw away all expired medicines. Wipe down counter using a clean microfiber cloth. Spray mirror with glass spray and wipe down with paper towel (or a crumpled up newspaper). 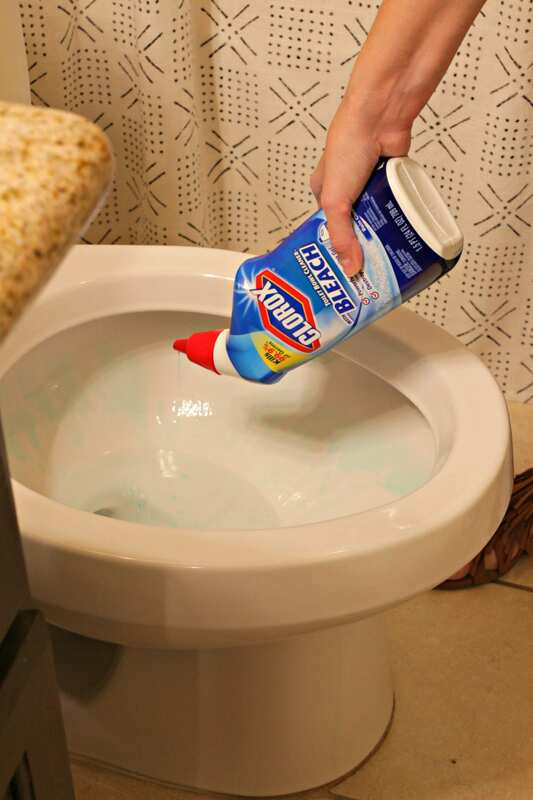 Apply Clorox Manual toilet bowl cleaner under and around rim to coat the inside of the bowl. Scrub the entire bowl with a stiff brush and allow to sit for 10 minutes to disinfect.Wipe down toilet with a microfiber cloth, focusing on areas that are usually forgotten like the bottom area. Throw away empty bottles of shampoo/conditioner, as well as old razors and soap. Spray the entire shower and tub with the Clorox Clean-Up All Purpose Cleaner and wipe down. Put away anything that doesn’t belong in the room. Fluff couch cushions and pillows. If you can, flip the couch cushions to allow even wear and tear. Tidy up coffee and end tables. Dust bookshelves if you have any. 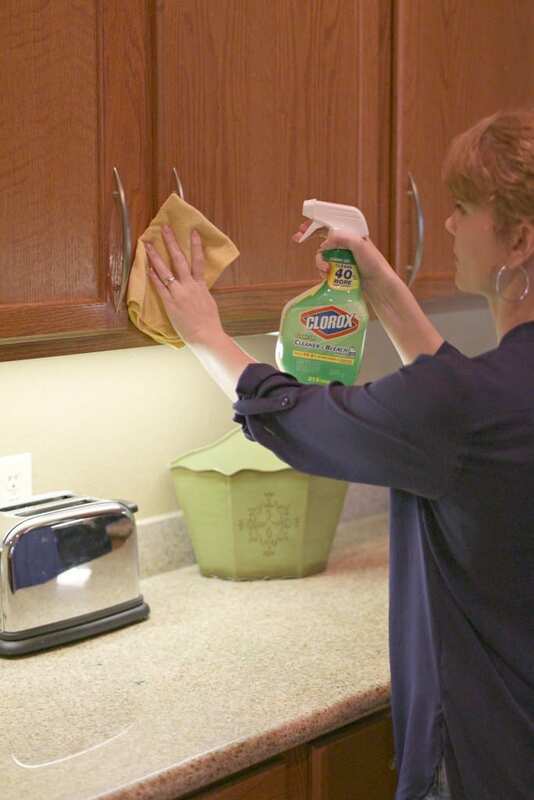 Dust off blinds with a duster and wipe down with Clorox Disinfecting Wipes. Do the same on the windowsills. Spot vacuum the couches and chairs. Vacuum or sweep/mop the floors. Tidy up by removing shoes, coats and bags that aren’t needed any longer. Remove welcome mat and shake off. Set it aside. Clean any windows with glass cleaner. Wipe down door using a microfiber cloth and all-purpose cleaner. Dust and wipe down baseboards. Lay down cleaned welcome mat. Switch out seasonal clothing and shoes. Remove items you no longer wear (don’t like them, wear and tear, too small or too big, etc.) and put them in a bag to donate. Tidy up shelves by removing items that don’t belong or need to be donated. Strip bed of sheets/pillowcases and throw in washer. If sheets are white, use bleach to get them sparkling white. Spray comforter with a fabric refresher. Clear the clutter off dressers, end tables, chairs and floor. Do a sweep of the room for trash and throw it away. Dust and wipe down the dressers, end tables and bed. Dust and wipe down the blinds and window sills. When sheets are clean and dry, make the bed. Dust and wipe down doors and baseboards. Check laundry supplies and restock if necessary. Throw away any empty containers, leftovers that have gone bad and any expired items. Wipe down shelves and drawers, focusing on any crusted on food and stains. Wipe down the front and sides (if able) and make it shine! 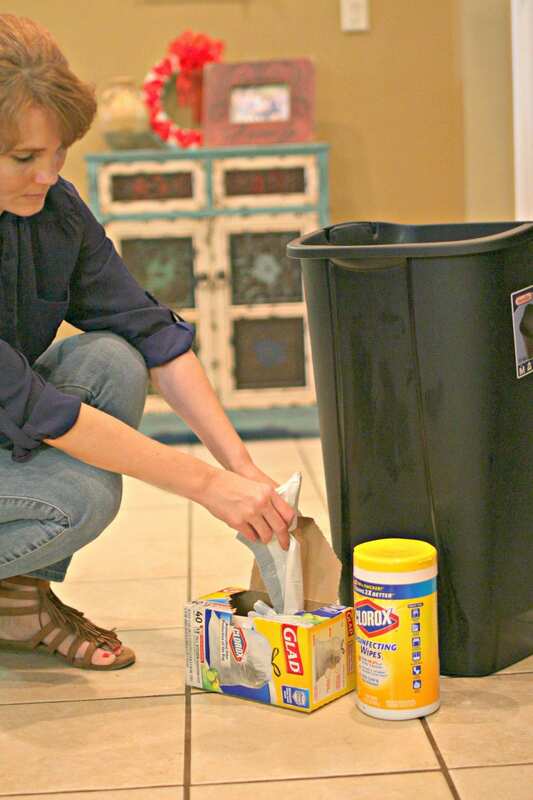 Add to your grocery list any items you threw away that need to be replenished. Change lightbulbs that have gone out. Put away any winter decor and get out spring decor. Put a vase of fresh flowers where you’ll enjoy them and pat yourself on the back for a job well done. There you have it! 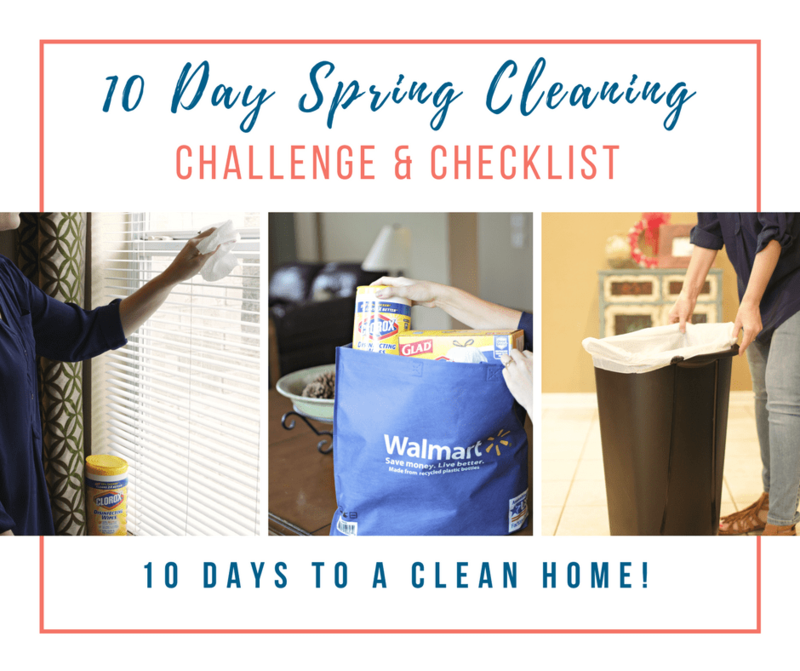 Ten days to a clean home. Here’s your printable 10-day spring cleaning checklist. After we do our taxes next week, spring cleaning is next up on our chores to do list! Gonna save this for when we clean! I love this checklist. We’re going into autumn here in Australia but its never a bad time for a good extended clean! Gonna get the housemates on board and totally gonna rock this check list! I love spring cleaning! Well, I like when everything is clean after I’ve done the work! !